Someone at Bad Robot finally decided they might need to start working on the Cloverfield Project. Earlier this week saw a new picture added to the 1-18-08 website featuring a Japanese cook and his recipe. Today we have the Tagruato Corp website, which by all indications is fully involved with the 1-18-08/Cloverfield/Slusho movie. JJ Abrams TV hit show 'Lost' has been fueled with mystery by the viral and fictitious Hanso Foundation. Those guys were a scientific group that created the orientation videos and various buildings on the island for unknown experiments. Now, Abrams seems to have taken a page out of his own book and created another fictitious organization and having subsidiaries which include the infamous Slusho company. The Tagruato Corp is a deep sea petroleum drilling company based out of Japan with industry related subsidiaries. Tagruato is a collective of top scientists, engineers, and businessmen committed to leading our investors and the whole of mankind into the future. We regard ourselves as explorers, and believe there is much more our planet has to offer than has already been discovered. We view every challenge as an opportunity for innovation. With our groundbreaking deep-sea drilling technology, Tagruato has positioned itself to become a world leader in energy resources, medical research, advanced technology production, and consumable product. Subsidiaries of Tagruato include YOSHIDA MEDICAL RESEARCH, SLUSHO!, BOLD FUTURA LOGO, and ParafFUN! Wax Distributors. YMR is a genetic research firm specializing in deep sea bioprospecting. YMR is a genetic research firm specializing in deep sea bioprospecting. YMR implements Tagruato's advanced exploration technology to study extremophiles found only in the deepest parts of our oceans. The understanding of such organisms that thrive in conditions of extreme pressure, temperature, and toxicity has boundless pharmaceutical and industrial promise. We explore cold seeps and seamounts, where species diversity is known to be as high a 1,000 per square meter. Hidden among these deep sea ecosystems is the potential for medical advancements that will contribute to the future well-being of mankind. YMR doctors are currently developing marine biotechnology drugs that may one day be used as anti-cancer, antioxidant, antibiotic, and anti-malaria. Treatment applications for Alzheimer's disease, cystic fibrosis, and herpes are also under consideration. Our hope and our belief is that the work being done at YMR will prove to be the key to a cure for the diseases that have plagued mankind for centuries. Created by Tagruato C.E.O. Ganu Yoshida, Slusho! brand happy drink is a icy cool beverage that is rapidly becoming one of the company's most profitable expenditures. Slusho! contains a "special ingredient" that customers can't get enough of. Bearing the slogan, "You can't drink just six! ", Slusho! has grown to the second most popular frozen drink in all Asian markets. Hip adult drinkers have begun concocting deliciously intoxicating alcoholic mix drinks starring Slusho! 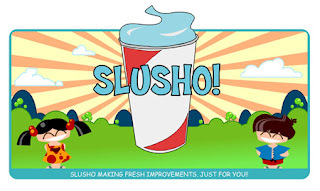 The beverage's popularity has spawned overwhelming sales of brand apparel, a hit theme song, and coming soon: an animated television show starring the Slusho! Flavor Droids! The next step is to introduce Slusho! to the rest of the world. A search is on for top marketing professionals who will be tasked with duplicating the drink's Asian popularity in the Western market. Our aspiration is to one day place Slusho! dispensers in every convenience store and mini mart. Slusho zoom! Bold Futura is the contractor sector of our company principally engaged in the conception, design, manufacture and integration of advanced technology products. Our engineering technology is the most superior of its kind. A machine made with Bold Futura parts works where others fall to pieces. A vehicle made with Bold Futura equipment will travel where others cannot reach. Our unique ability to function in areas of severe temperature or pressure can have desirable implications for our clients. In the past, Bold Futura has partnered with military organizations, space exploration institutions, and arms manufacturers. Confidentiality is the first pillar of Bold Futura. We keep the identities, orders, and intentions of our patrons strictly to ourselves. If you are interested in partnering with us, email us at the address below. Let's build a bold future -- together! One of the many byproducts of our Petroleum reservoir is paraffin wax, an alkane with dozens of handy uses in your day to day life! Edible, malleable, colorable, and a fine electrical insulator. ParafFun! Wax Distributors meets all your wax needs. Coating your hard cheeses? ParafFun! Preparing specimens for histology? ParafFun! Coating your waxed paper? ParafFun! Propelling your hybrid rocket motors? ParafFun! Lighting your camping lantern? ParafFun! Testing samples in infrared spectroscopy? ParafFun! Making a box of crayons? ParafFun! Tagruato explores the final frontier on planet earth -- the deepest recesses of our oceans. Our scientists and engineers have created drilling technology that can withstand degrees of extreme pressure, cold, and heat never before thought possible. This groundbreaking feat of industrial triumph allows for research and retrieval in areas previously unexplored by man. Tagruato covers the planet. We have fourteen drilling stations strategically positioned around the globe, each a billion dollar marvel of modern engineering. Thousands of hardworking, well-paid, satisfied Japanese employees man their posts with honor and integrity. From the Arctic Ocean to the Mid-Atlantic ridge, we go deep. Capable of excavation at distances exceeding 7,000 meters of water and 9,200 meters of seabed, the greatest depths of the oceans have been opened for business. The implications are vast and bountiful. Tagruato boasts sole ownership of the functionality designs implemented in our drilling stations. This gives us unparalleled access to the natural resources that lie below the ocean floor. Namely Petroleum, the most sought-after resource in the world. Opening these new regions is projected to boost Japan's national oil reserves by as much as sixty percent. Analysts believe that with the bounty it is about to attain, Tagruato will soon join the ranks of the world's wealthiest corporations. After months of very little activity (except a little roar in August) the official site for 1-18-08 has added another picture to its gallery. This time it features something a little out of the ordinary. What looks like a Japanese (I assume) chef is seen in the kitchen really enjoying a tray of unknown food items. Flip the picture over and a bunch of Japanese text is scrawled over it. Since I'm no expert in Japanese it will take some time to figure out what it really is. However, a quick guess is that it is a recipe from the cook pictured. The fractioned numbers and ordered list make that my guess. Everybody, thank you for viewing! I'll introduce this week's delicious recipe. Please make sure to keep this one cold! *Soumen (a kind of japanese noodle) - 10 oz. rice wine) - 2 tbsp. Go go Oishii ("delicious") Chef! I get a lot of emails and comments in regard to the true '1-18-08' website which is the official site for the movie. The majority of them are about flipping the pictures over and the roar that occurs about 6 minutes after opening the site up. 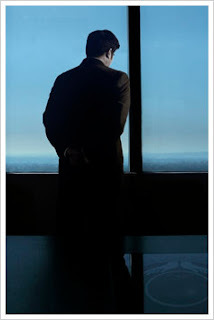 The '1-18-08' website is the official site of the movie. It gained notice back in July a week or two after the trailer appeared before the Transformers. It featured a single picture that you could move but not flip over. Four more pictures would appear and then no updates occurred. Somewhere in early August it happened that the pictures could be flipped over. There's some writing on 2 of the pictures. August 23rd saw the site go down for a day and redirect toward Paramount Pictures, who is distributing the film. The site came back up later that day with no visible changes. August 24th saw the audio file of the monster roar for the first time. The sound file was added during the downtime the day before and if you opened up the site and left it untouched you would hear the monster roar about 6 minutes later. Someone made a fairly decent fan trailer for '1-18-08' which was released this week. It features a reporter for the news station seen in the original trailer. One viewing of the clip will instantly give you a very amateurish feel with pieces lifted from the original trailer. However, I can't knock the creators of this fan film too much. They did a good job and so far have put our more this month than JJ Abrams and Co. So when will trailer 2 surface? There have been a couple of rumors that one would show up during the showing of 'Resident Evil' which opened last week or during 'Stardust' a few months back. The safe money says the trailer will be controlled by JJ Abrams and Paramount. This movie has a lot of buzz and Paramount is probably going to release the trailer (if they have a say) during the opening of one of their movies. 'Resident Evil' was released by Sony and it doesn't make sense to promote the opening of a rival studios film unless they are willing to return to favor. My money is on "Beowulf" for a couple of reasons. First, it's the only film on the list produced only by Paramount (no Dreamworks) and is tracking real high with it's buzz. "Beowulf" has gotten a lot of buzz for its CG-laden retelling of the classic story as well as a huge 'geek' boost from all the CG animation of Angelina Jolie, which was promoted during July's Comic-con. Second, November 16th is 2 months before the main release date for our movie and a perfect time to kick up the buzz and interest in '1-18-08' during the busy holiday season. The audience for both movies matches up great. Of course the bad news is that it's still 1 1/2 months away and I don't want to wait that long. Ain't It Cool News (AICN) is giving a report that FX master Phil Tippett is working on the JJ Abrams Project Cloverfield. No details were given and Tippett's been in the business long enough you won't see an accidental leak. A quick note about JJ Abrams related 'Lost.' The new fall season has started this week and many of you will not see 'Lost' in the lineup even though it is still active. The producers and ABC have agreed to air the episodes in sequence starting in early February. So, '1-18-08' will have arrived 3 weeks before new episodes of even 'Lost' air. Jamie and Teddy is the newest site linked to the Cloverfield/1-18-08 movie. Jamie Lascano, one of the characters featured on the alleged MySpace profiles, is linked to the website. You also might recognize her in the current top pictures from 1-18-08, the official website for the movie. The Jamie and Teddy website has 2 pages which are the index and a movie clip page which is password protected. The video is a lot like the MySpace profiles in general so far in that it seems to be a nothing special about the movie. Apparently, Jamie has a bladder infection. My hope is this either starts a trend of opening up the characters and/or storyline with additional viral sites or they start hiding relevant clues within the videos. Click the picture of the bears on the main page to go to the video page and you'll see a password box. Don't worry. The folks at unfiction have crack the code (it's 'jllovesth') and it opens to the movie page with only one video at the moment. 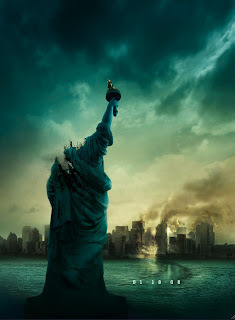 Will Cloverfield Be Politically Correct? A little side note to ponder while we wait on more Cloverfield/1-18-08 movie news to appear. The addition of political views to a MySpace blog is innocent enough. However, there might be more to this little connection than just a MySpace profile. Katie McGrath Abrams, a public relations exec and wife of "Cloverfield" producer J.J. Abrams, is part of a group of Hollywood executives which have teamed with a veteran Washington Democratic to create a political production company with an eye toward playing a major role in the 2008 election. First Tuesday's goal is to utilize the creative minds of Hollywood to make various content, including web based and television media, with specific intent to push a political agenda. With a critical Presidential election gearing up it will be interesting to see how or if First Tuesday Media will be involved with the Cloverfield project. 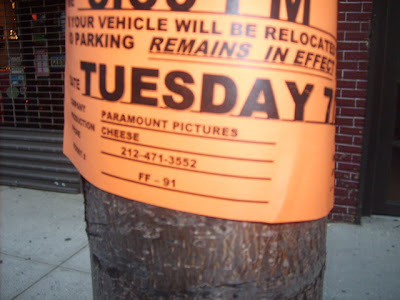 If the movie continues its viral ways and the characters start to develop through their social networks like MySpace, it will be interesting to see if First Tuesday dips their toes into the Cloverfield pool. The relationship of First Tuesday and JJ Abrams has already overtaken the Abrams marital connection. According to the Resumé of Rosser Goodman, a 1st A.D. on various movies, TV shows, and commercials, Rosser worked with director JJ Abrams for a "Get Out The Vote" commercial in 2006 for First Tuesday Media Productions. A post on the Cloverfield IMDB forums has revealed inside information on the new JJ Abrams monster film. Usually, these posts are full of wild ideas with way too elaborate details on the movie. This guy, however, has filed a basic and logical summary of the movie. Essentially, the post tells of how the producers got in over their heads on a real basic action film. Fan frenzy diverted time and resources to rewrites and trying to live up to the hype. So.. basically I came across this board and found a lot of interesting theories and many ridiculous ones as well.. I myself became a a fan of the trailer and (like many of you) have been trying to and out what this movie is about. As a member of the entertainment industry.. I was finally able to crack someone (a friend I trust) inside into giving me at least some details...(No, it's not J.J or Reeves or someone big.. but he/she does work and has been on set of the movie... And since he/she, like anyone working on the movie, are on a strict gag order, I figure I will post this as my own "THEORY" in order to protect him/her. So this is my "THEORY"
The monster is not American at all.... The monster did go through its infancy and grew up under the Atlantic, but its origin, like Godzilla, came from Japan. This is where the Slusho reference comes from. Slusho does have a part in the movie, but is not as significant as people would think. It plays a small role in the beginning of the movie as to the origin of the monster. This was as much info on the monster as I can get... the reason for this is because no, including cast and crew has actually seen the monster. I don't even think J.J knows what the final monster will look like.. that is being kept very secret... The monster will be entirely in CGI where, indeed, most of the films budget will go.... There weren't even any animatronic hands or feet on set which implies that there will be no real/direct contact with the monster and cast (unless it's all CGI)..... And as for the theories of multiple monsters... NO.. sorry, it is only one gigantic monster. To conclude, it is not Godzilla, A lion, Voltron, Rampage.. or any of the other monsters people have been thinking... it will be original and it will be a Creature of some sort (not robot)... they are still working on what it will actually look like.. So everyone has been wondering what the title will be... and you are no different from the producers... when production began.. the film still didn't have a title... Cloverfield, Slusho, Etc. were just working titles (I'm sure we all knew that) But J.J really, really wanted to get the trailer out in time for the release of Transformers since he's smart and knows that it will be seen a lot with a blockbuster like that... So what do they do... they push it with no title and what they had shot already.. hence... we all saw what some have said to be the greatest trailer ever made.. though it was all pretty much a fluke by J.J for not having a title ready... not to say that they didn't know what they were doing... I'm sure they wanted the movie to seem mysterious.. but there was not title to release at the point... And if that weren't enough.. they did decide to release the title at Comicon..but after the poster leak fiasco.... they scratched it and went back to the drawing board... It was going to be Monstrous (and they saved themselves by releasing other posters with other adjectives)... but because of the leak.. they decided to change it again... soon Overnight and Parasite were scratched and the newest "weak" title "Wreck" will soon be scratched... For some reason J.J wants to keep the title one word.. it's like his thing (Alias, Lost).. and not very elaborate titles.. just basic words... but I dunno if we'll be happy with the final title...but as for now.. they're still working on it.. Which leads to the new trailer that will soon come out that will AGAIN have no title!!!! What is up with that.. give it a title already!!.. But the new trailer will consist of actual scenes related to the aftermath of the first trailer.. This includes Rob among other friends struggling to get away from the monster (which won't be shown of course.. again)... ad find themselves at a first aid center where (as I have seen on previous posts on the new trailer).. will have "infected people".. but no.. this will not be a monster/zombie movie.. the infection is a result from a mysterious ooze that comes from the monster.. upon contact.. they get sick and may look like zombies.. but do not hunt for brains... It just makes them look like crap for some reason..
Cloverfield/1-18-08 To Be Called Wreck? One of the biggest mysteries of the Cloverfield monster movie is what the bloody title of the film will be. The codename Cloverfield and the release date 1-18-08 were what we have been accustomed to calling the film. Now, a website called Bloody-disgusting is claiming the new title of the film will be WRECK. This goes onto the list with MONSTROUS, PARASITE, and OVERNIGHT. The title 'Wreck' doesn't really seem to fit the movie but it is better than Godzilla. I'm starting to lean toward the notion that they are using the Internet as a test base. What better way to gauge fan reaction than to trickled out an idea and watch how people react? I get a lot of questions regarding the 'Slusho' connection with the Cloverfield/1-18-08 movie. As people discover clues about Cloverfield, the Slusho name comes up quite a lot. In fact, the Slusho site and name are one of the few confirmed entities for Cloverfield. 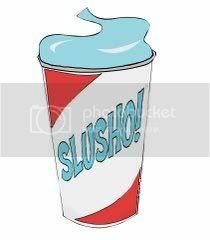 The basic answer to the Slusho question is that Slusho is a Slurpee-type drink that was briefly mentioned in an episode of 'Alias' a few years back. 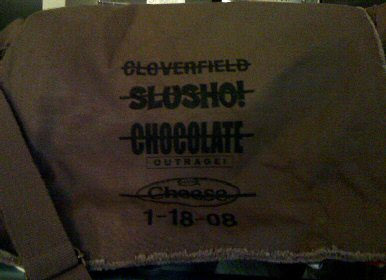 The bigger question is what, if anything, does Slusho have to do with Cloverfield/1-18-08? 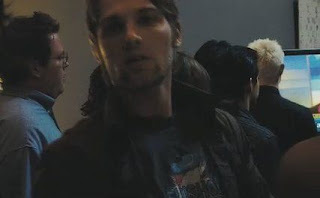 Slusho first appeared on the T-shirt of this guy (above) in the trailer. Since then, the shirt was made official by being distributed in connection with the movie at Comic-Con in late July. The movie and the site were officially confirmed by the JJ Abrams camp as being tied into the movie. A Slusho site was added later. It claims it is a Japanese based company that gets its secret ingredient from the bottom of the ocean. "Slusho! – You Can’t Drink Just Six" is the official tagline for the product and there is as of yet no confirmation on what that really means. JJ Abrams likes to use numbers in his clues and this may be just another unsolved mystery. As the Slusho story goes, Noriko Yoshida, called The Little Whale in school, dedicated her life to refreshment and was lost at sea while looking for the most satisfying ingredients. Her son, Ganu, turned her refreshment business over to his cousin and focused on ocean science. While at sea Ganu and his crew discovered a new, deep-sea ingredient unlike anything else. That night he had a dream where he was a small fish and a whale visited him to tell him to use the ingredient. As Ganu ate the new ingredient he grew large and turned into a whale. He woke up in tears knowing he had found the lost ingredient his mother had lost her life for. Ganu turned his attention back to the refreshment business. The special new ingredient was found in the depths of the ocean at cold temperatures and tremednous pressure which is why it has to be served in a near-frozen state. Ganu rejoined his cousin with the new ingredient to make what we know as Slusho. Alias - Want A Slusho? JJ Abrams has a knack for using code names and fake products in his work. During the filming of 'Cloverfield' the movie saw movie names such as Cheese, Chocolate, and Slusho. Abrams uses fake names regularly during his shoots to detract onlookers and the press. During the filming of Mission Impossible III, the Virginia shoot was titled 'Heyday' for example. 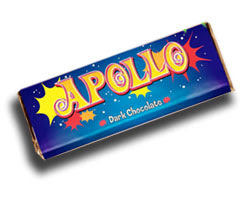 The viral marketing of JJ Abrams took off during LOST when the candy bar Apollo was mentioned in the series as well as having websites dedicated toward it. Sites popped up for the airline, too, at Oceanic Air (here). Small teasers such as pictures, quotes, and clips were hidden within the Oceanic site for fans to discover. Of course, the HANSO Foundation (here) was the biggest of Abrams viral sites. The HANSO site tied into the series as the driving force of the island and viewers could regularly check the site during the first few years of the show to see mysterious notes and videos there. It is hard to say what role Slusho will play in the movie. Looking at the past Abrams projects we can expect Slusho to be at the least a great marketing ploy to sell some t-shirts. We could probably see the product mentioned in the film in the form of product placements. However, I'd like to believe the main character, Rob, who is moving to Japan the night of the attack, will be somehow working or affiliated with the Slusho Company. Maybe we'll see some Slusho products being consumed and reference. Maybe we'll see that the monster is an ocean-bound creature whose life has been upset by the Slusho people.